Winner Erik Hjorleifson with runner up Sumon Sarkar. This past weekend the third installment of the Falcon tour took place at The Corner Bank in Scarborough, Ontario. This tournament drew a very strong field in which 20 of the players were a AAA handicap or above which had the tour living up to its reputation as the most competitive tour in Ontario. The player auction once again drew a healthy total with an average of almost $100 a player reflecting the amount of players that were subject to be in contention for the title. Tournament favourites included myself, Mario Morra, Jeremy Bolahood. Along with top players from London making their first appearance in Dave Parker and Tyler Nearing who was coming off a significant challenge match win earlier in the week at The Corner Bank against Carlin Sanderson. In Saturday play I advanced to the winners side final with wins over Rod Arsenault AAA, Naomi Williams AAA who had a strong win against Tyler Nearing in the first round. I was also victorious over Jeff Robson Semi pro and former top player Charlie Burkowski who is on his way to regaining his past form. On the lower half of the draw, arguably the most improved Ontario player in the past 2 years Sumon Sarkar made his way through undefeated including a strong 8-2 win over Mario Morra. Sumon also had a notable challenge match win against Dave Parker on Saturday night. On the losers side four players would return including losers of the winners side semi finals Mario Morra and Charlie Burkowski. Consistent strong finisher Jeremy Bolahood would return and Tom Fraser who was moved from AA to AAA in this tournament was proving he could compete at the next handicap level. 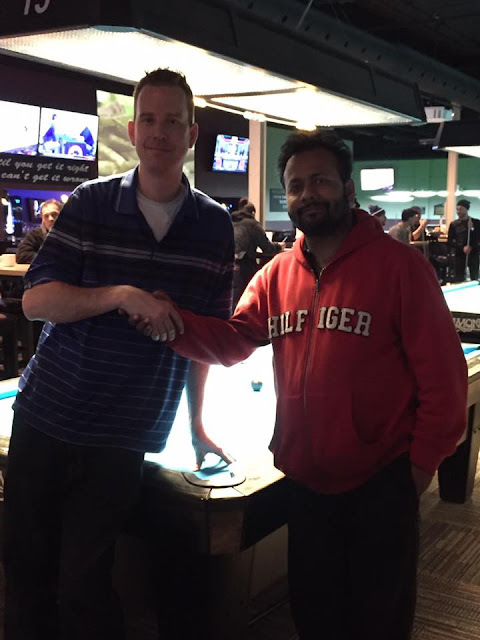 On Sunday I came out with a near flawless match against Sumon Sarkar to take the hot seat. Jeremy Bolahood and Mario Morra advanced to the 4th place match including a narrow hill-hill escape by Bolahood. Jeremy has been a great player for years with time spent in Ontario and the U.S. he has had Morra's number over the past few months and this time would be no different as he came away with an 8-7 win. In the 3rd place match the ebbs and flows of a weekend long tournament were evident as Sumon Sarkar came away with a 8-0 win against Bolahood in a match where he struggled a little and Sarkar took full advantage. The final was a little scrappy, I got out to a 3 game lead after the first 7 games and got to the hill first at 9-5 in this 10-8 race. I had chances to close him out in the next two games and I was unable to, kind of odd considering my level of play the rest of the weekend. In the hill hill game I was able to make a nice 1 ball and ran out for the win. A big congratulations goes out to Sumon for his deepest finish in a high level tournament with strong wins along the way. He is living proof that hard work in this game pays off and we will all be watching to see the heights he can reach. This is the final stop on the current calendar for the 2016 Falcon tour and we will be awaiting announcements in the near future outlining the plan for the rest of the year. Special thanks goes out to The Corner Bank in association with Jim Wych and John White who have really taken the game to a new level in Ontario in the past year.